Gold Award winning Tremeer Farm offers glamping with hot tub in Cornwall with four exquisite yurts and newly converted Long Barn are perfect for a family adventure or romantic retreat. Tremeer is a small traditional Cornish family-run farm nestling in a quiet un-spoilt valley a mile from some of Cornwall’s most idyllic beaches and close to the Fowey River. Imagine a real log fire in the log burner while you gaze at the stars, sit around a camp fire roasting marshmallows, lazy days exploring hidden coves and cooking mussels on the beach or relaxing in our wood fired hot tub. A highlight for many of our visiting children is feeding the animals in the mornings. This includes Rosie (our pet Kune Kune Pig), the Dexter cows and calves and depending on the season bottle feeding orphan lambs or tickling the tummies of piglets. 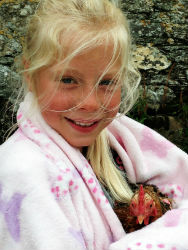 We encourage our visitors to collect their own eggs for breakfast from the chicken coup. Parents are very welcome to join in but for some this gives a welcome time to enjoy a quiet cup of coffee. During the holidays we endeavour to involve children in some spontaneous arts and crafts or camp building activities. If you are looking for a relaxing and memorable holiday our farm is a wonderful location. Tremeer is also a wonderful location for groups to get together to celebrate those special occasions. Our Long Barn offers versatile accommodation which can accommodate 2 families or grandparents (8 plus cot) and has a stunning 30ft living space with range cooker and large gable end window. 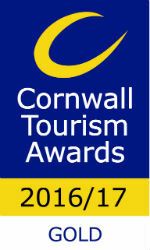 The Gold Award presented by the Cornwall Tourism Awards for Glamping Business of the Year! 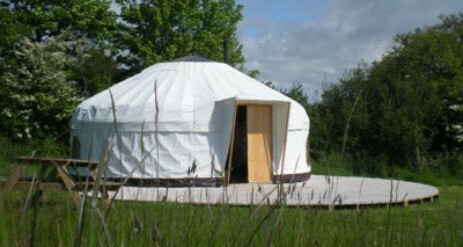 We have four 18ft Mongolian-style yurts which each sleep up to 5 people. All have their own unique character and are furnished with sumptuous feather duvets, beautiful linen and unique quilts. They have a woodburning stove to keep you warm on cooler evenings. Solar powered fairy lights add to the magical atmosphere. 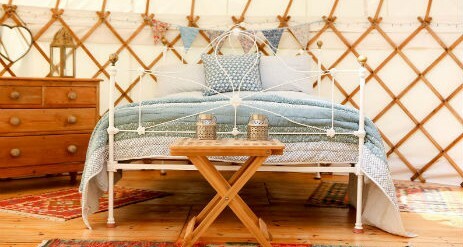 Our yurts are well spaced apart and you are therefore very unlikely to have noisy neighbours. It is rare to hear any traffic, indeed, the only late night noises you are likely to hear will be the hooting of the owls. Our Grade II listed Granary and Cowshed kitchens are approximately 100 yards from each of the yurts. 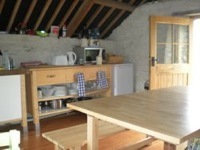 Both of our kitchens are well equipped and have kitchen tables and chairs. (A little further from the top yurt). We aim to provide everything you should need to prepare simple meals. Each kitchen is shared between 2 yurts. There is a charcoal and gas BBQ available outside. 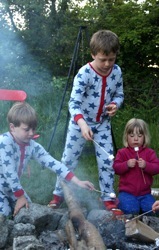 Alternatively you can cook over an open fire. Each yurt has it’s own authentic fire pit where you are welcome to have campfires, toast marshmallows or even cook your evening meal over an open fire. We have a large rustic barn which is a wonderful place for both children and adults to gather in inclement weather. In here you will find indoor badminton, table tennis and volleyball as well as various children’s toys. OUR WOOD FIRED HOT TUB is a hit with the young and old alike and is the perfect place to relax under the light of the moon after a day spent exploring some of our hidden coves and beaches. Tremeer is a small traditional Cornish family run farm nestling in a quite unspoil valley a mile from some of Cornwall’s most idyllic beaches and close to the River Fowey. 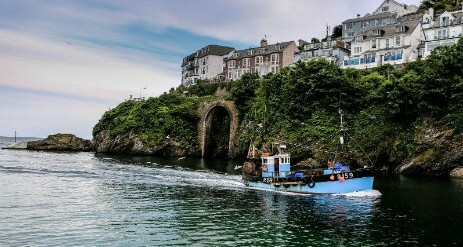 Discover some of Cornwall’s traditional Fishing Villages, Fowey, Polruan, Polperro and Looe are all close by and The Eden Project and Lost Gardens of Heligan are easily accessible. Tremeer is a wonderful place for groups to join together to celebrate a special occasion. Over the past 6 years we enjoyed hosting a number of very successful group holidays including: family reunions, “special” birthdays, yoga courses, wild swimming groups, hen nights and walking and activity holidays and school groups. Our four yurts and Long Barn can accommodate up to 28 guests. 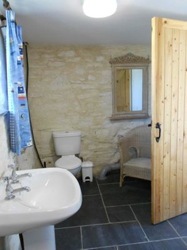 Our Long Barn can accommodate up to 8 guests plus a cot. It many also be possible to pitch further tents if required (for an additional charge). We have just completed the renovation of our Long Barn which offers spacious unique and flexible accommodation for families and groups. It has level access (please speak to us about your individual requirements) and will be available throughout the year. Wild Strokes Retreat is an invitation to step away from our daily lives and into the ebb and flow of the Southern Cornish coast. Through a daily rhythm of meditation, walking and wild swimming we will create and cultivate opportunity to connect more deeply to ourselves, to each other and to the physical landscape that hosts us. 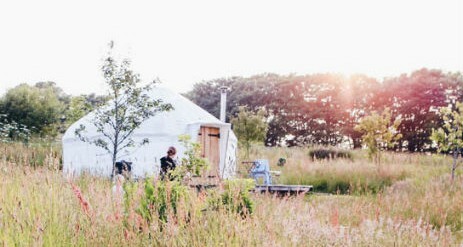 Win a three night stay for two in a beautiful yurt at Tremeer Farm! Lazy days exploring hidden Cornish coves, relaxing on the beach at Lantic Bay, soaking in the wood-fired hot tub, sitting round the camp fire roasting marshmallows and falling into bed with the log burner going, gazing at the stars.